I just learned that my school Franklin will be losing 6 full time teachers next year. Other South Seattle schools are also apparently losing teachers. For a district supposedly committed to equity this is shocking. We'll have to either cut out some of our electives ( we already are pretty limited - 1 ceramics teacher, 1 drawing/painting teacher, 1 music teacher, 1 drama teacher in the arts, for instance, so what do we lose?) Or cram more students into core classes if we lose non-elective teachers. I teach English. 65% of our kids speak a language other than English at home. Around 70% are free or reduced lunch eligible. Let's lose 6 people at the Central Office ( I'd like to see the Director level abolished) and keep teachers in the buildings. There was some discussion about how Running Start students aren't count and therefore, the school's enrollment count drops. Maybe Kellie LaRue could give us some insights on this issue. According to the Seattle Times, Amazon apparently is not going to fill Rainier Square after all (using it as leverage to get rid of Seattle's head tax). They want to sublet. Here's a thought: be a good corporate citizen and allow SPS to use one floor (or lease at low-cost) to create a downtown school. And also from the Times, who thinks the McCleary funding is all done, a story that "most districts are projecting budget shortfalls." Who would have thought that would happen? The winter weather and related schedule changes have been a challenge for many and we thank you for your patience. In February, school closed for five days due to the series of snow storms. This year’s school calendar included two make-up days in June (June 21 and 24); the three additional make-up days will be added to the calendar following those days as outlined in the 2019 Collective Bargaining Agreement, with the Seattle Education Association. The last day of school for students in grades preschool through 11 will be June 27. Update - Tuesday night: These two high school policy items have been postponed to a later meeting. The Board meeting this Wednesday has a couple of items of interest for high school parents. I am honestly shocked that these changes were not widely distributed and discussed at high schools before any kind of change. The first is Amendment to Board Policy No. 2024, Online Learning; Repeal of Board Policy No. C16.00, Acceptance of Correspondence or College Courses for High School Credit. A fascinating outcome from this little blog is the growth of the number of stories we cover on state and national issues. For myself, I had always wanted this blog to be about Seattle Public Schools and the issues and challenges it faces. 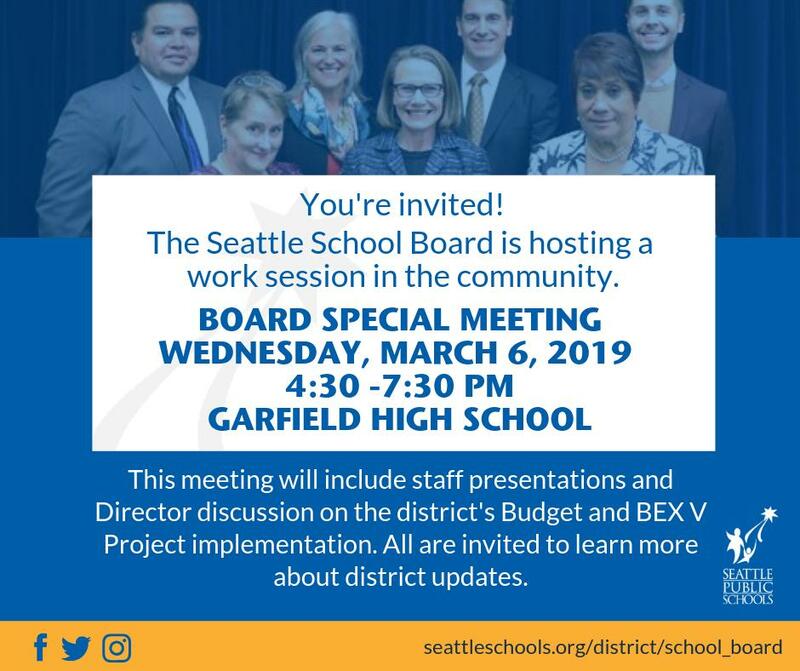 (Over the years, I've had many people ask me about Bellevue or Lake Washington SDs and frankly, one district is enough to track.) But, after a period of time, it became impossible just to focus on Seattle Schools. One, because in Washington State, our schools never were fully funded. That ongoing struggle impacted Seattle Schools and other other districts for decades. Two, because no district, especially the largest one in a state, exists in a vacuum. The national issues of No Child Left Behind (now ESSA - Every Student Succeeds Act), Common Core, charter schools, vouchers, school safety, etc. all came into play as issues that did affect SPS. Third, the influence of billionaire philanthropists who thought that public education would be an easy fix for them. Because rich people must be smart at everything. (And, of course, for those who want to privatize public education and destroy unions, starting with the biggest unions which would be the teachers' unions). Donald Trump Jr., the President's son, seemed to invoke striking teachers during a speech last month in El Paso, Texas, when he dismissed "these loser teachers that are trying to sell you on socialism from birth." Through headlines like “Rotten Apples” and “Why We Must Fire Bad Teachers,” the corporate media blamed educators for the failures of our schools while ignoring the cuts that were making teachers’ jobs increasingly difficult. Converting public schools to charters and using standardized test scores to close schools and fire teachers have been touted as “solutions” to our “broken” education system that conveniently did not require increased or more equitable funding. Continuing on with the story about the Check Yourself mental health screening tool for middle school students in the Puget Sound region. King County is funding this effort thru the Best Starts for Kids levy. Seattle Schools (as well as about eight other districts) is participating. I believe in helping middle schools students who may have mental health issues, big and small. I'm glad King County wants to help districts help those students. But the way this effort being cared out is wrong and, I believe, in some aspects, is being done illegally. Again, I tell parents - do NOT allow your child to take this screener. Period. I have an expert standing by who will be happy to help you. Via SPS' Twitter feed: Congratulations to @NH_Raiders Dominic Damon on becoming the first wrestler from an SPS school to win a state title! I - love - this - kid; show your kids that having a talent, any talent, is something to be proud of. So wonderful. Yet another kid to love for his incredible talent- show your kids this video as well. The Board seems super excited about this. I mean it's great to do this out in a school but 1) it's a Work Session so you'll just be sitting there and listening - there is no public interaction and 2) wish they would do a Board meeting. Congratulations Jasmine Gayles on eclipsing 1,000 career points! This would be West Seattle High School basketball star, Jasmine Gayles. Have a senior? Have them open a BECU account because then they can apply for these scholarships. Amazon has a number of summer camps/internships for STEM-minded kids of all ages. In the Friday Open Thread, I mentioned how difficult it is for students and adults with disabilities during big weather events. We are going into an election season for City Council that will see many new members. I urge you to bring this up with candidates - all parts of the city need sidewalks and they need to be ADA accessible. Here are the comments from that thread that I found compelling. I was listening to KUOW's The Record where they were discussing challenges during the snow days. Jessyn Farrell said that she believes the district and the city should talk more and earlier. Update: Peters tells me that the AL head job description hasn't been posted yet; what is there is just some old description they have for the job. As she points out, it is odd that even the old description says nothing about 2E students or even accurately describes the scope of the job. The following is a guest post from former Board Director Sue Peters. I note that in addition to the departure of head of Advanced Learning, Stephen Martin, SPS is also seeing the exit of Executive Director Kim Whitworth (corrected, my error). There were 12 NOIs (Notices of Intent) submitted to the Washington State Charter Commission this fall. I'd be surprised if more than six even submit an application; it's a heavy lift to get done. There were some surprises as I researched each NOI. That the two assistant principals at West Seattle High School, Scott Canfield and Garth Reeves, have submitted an NOI. That would be for Cascade:Midway High School in south King County to start in 2021. They are getting help via the Washington Charter Schools Association which accepted them for their School Leadership and Design Fellowship. What is the State of Charter Schools in Washington State? The state of charter schools in Washington State is uneven at best. Since the original 2012 law was passed for 40 schools in five years, we are now at 12 charter schools. The first charter school - First Place - closed in a year due to both financial and management issues. Now, a second charter, Soar Academy in Tacoma, a K-8 school, is closing at the end of this school year, mainly due to Special Education costs. Soar's closure will end the only K-12 continuum of charter schools in the state. And yet, the Seattle Times, a local charter cheerleader, hasn't bothered to cover it. An oversight? I doubt it. Tomorrow will mark the one-year anniversary of the 17 murders and 15 injuries at Marjory Stoneman Douglas High School in Parkland, Florida. Students who survived and have spoken out have been called "crisis actors." It is hard to believe in a country built on democratic speech that anyone would attack children speaking out after what is likely the worst day of their lives in a place where they should feel the safest. Great news on the passage of SPS levies. However, technically, levies are just a pot of money that the district can do whatever they want with it. Of course, it behooves them to do what they promised to do. Oversight is key and I hope the Board and parents and the public make sure that happens. Interesting story on teens who DO want to get vaccinations despite what choices their parents have made in the opposite direction. Washington's Paramount Duty has changed their Lobby Day at the Legislature to Wednesday, Feb. 27th. Sign up here. Speaking of the Legislature, here's the Washington State School Directors Association (school board members), has a weekly legislative update for news on public education related issues. On February 8, Governor Inslee issued a proclamation declaring a statewide state of emergency related to this week’s winter storm. We expect the proclamation to be lifted at midnight on February 15, 2019. Wednesday, Feb. 13th - schools are closed (again). Election results - both levies passed. An update on the story at Washington Middle School where the principal flipped schedules at the semester with no warning to students or teachers. The students did hold a protest outside the school last Thursday. They also wrote a thoughtful letter about their concerns. The principal, Emily Butler-Ginolfi, has not acknowledged the letter nor the protest as of the date of the letter. Get that ballot in for the Seattle Schools’levies; even The Stranger says yes to them. There’s a levies rally this Saturday, the 9th, at Cascadia in support of the levies from 10-11 am. Another snow day. I have been seeing rumblings from parents on Facebook about the school year calendar and there being three snow days (but one passed in January). I'm surprised at the number of people who make plans for the last day of school. A reader requested a thread on the feedback to the draft Strategic Plan that was discussed at a Board Work Session this week. I see that the Steering Committee is having another meeting on Monday, Feb. 4th; I'll have to see if I can attend. I did not attend this Work Session; here is the agenda/attached documentation.